The event was cancelled after a campaign by Zionist organizations demanding the silencing of Kasrils. In particular, the museum cited a June 2018 resolution by the Vienna City Council to bar cooperation with the BDS movement. It should be noted that the cancellation of the venue for Kasrils’ talk came only one day after BDS Austria issued a statement of solidarity with Rasmea Odeh over the attempt to silence her voice, cancel her visa and exclude her from Europe after a coordinated U.S./Israeli campaign against her planned speech in Berlin on 15 March. In both cases, the voices that these forces are attempting to silence are those of progressive strugglers with a long history of involvement in the liberation movements of their people. These are critical, anti-racist, revolutionary voices that far-right forces – whether in Vienna, Berlin, Washington or Tel Aviv – are united in attempting to silence. Anti-BDS laws and similar repressive mechanisms are intended to halt the growing movement in solidarity with the Palestinian people. These attacks are also intended to create an atmosphere of fear, terror and intimidation among the Palestinian and Arab communities in cities like Berlin, Vienna and elsewhere in Europe. They come hand in hand with threats to public funding for progressive institutions and particular centers and spaces linked to migrant communities. Therefore, these types of cancellations reflect a multilayered racist assault: against Palestinian and Palestine solidarity organizing confronting Israeli apartheid and Zionist racism; against anti-racist strugglers with decades of experience in liberation movements whose voices are incredibly necessary amid far-right incitement in Europe; against Palestinian and other migrant communities already facing vicious attacks in their communities in an attempt to prevent and silence their organizing. We echo those words and warn of the increasing repression of anti-racist strugglers, especially those who are involved in supporting the struggle of the Palestinian people for liberation. The museum’s act to cancel Kasrils’ talk echoes the repression of the South African apartheid regime – not to mention the ongoing forcible cancellation and suppression of Palestinian activities and events throughout occupied Palestine. It should also be noted that just as Kasrils struggled for the liberation of political prisoners under apartheid South Africa,he has been a clear and consistent voice in support of the liberation of Palestinian political prisoners from Israeli jails. The messages, speeches and presence of Rasmea Odeh and Ronnie Kasrils should be welcomed by all who care about a just world or a liberated society. These lifelong fighters against racism and oppression have so much knowledge and experience to share with those taking up these continuing struggles today. It says a great deal about those who would use the power of the state to prevent them from passing on that experience and sharing their progressive vision for the future, in sharp contradiction to that of Zionism, imperialism and reactionary regimes and forces. We express our strongest solidarity with Ronnie Kasrils, BDS Austria and all of the organizers of Israeli Apartheid Week events confronting repression and raising the banner for a liberated Palestine around the world. 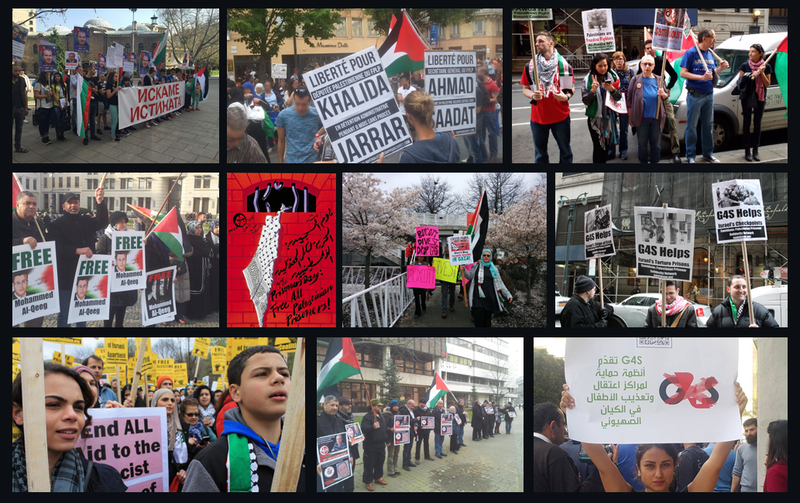 Together, we will continue to struggle for justice and liberation in Palestine and around the world – even more loudly and even more clearly. Rasmea Odeh and Ronnie Kasrils will continue to inspire all of us – and people around the world – to keep on marching forward. We urge all supporters of justice in Palestine to attend Ronnie Kasrils’ events in Vienna and Berlin on 29 March!